This page contains additional resources for the Systems class. In the video below, The Power of Networks from the RSA, UK, Manuel Lima, senior UX design lead at Microsoft Bing, explores the power of network visualization to help navigate our complex modern world. The videos below address the different facets of systems theory and explain the dynamic relationships at work within both natural ecosystems and social systems. We have intentionally included videos that explain these ‘systems’ principles’ in scientific terms as well as those that say the same thing in narrative form concerned with quality of life issues. A common theme in all of these is the relationship between parts and wholes and the important concept of emergence (the sum is greater than the parts). These provide a good overview of the important dynamics at work in complex systems — the greater context for everything we design. Transition Designers are aware of these often subtle dynamics within the systems for and within which they work and can learn to ‘leverage’ these dynamics, much as a martial artist will leverage the momentum of his opponent. This brief video discusses the characteristics and dynamics found within complex adaptive systems, in scientific terms. Concepts such as chaos and complexity theories, network dynamics etc. are addressed. Excerpt from the film Mind Walk made by Bernt Capra, Fritjof Capra’s brother, in which a scientist, a politician and a poet discuss two different ways of understanding the world — the mechanistic and the holistic — whilst wandering around the island monastery of St. Michel in France. Scientist James Gleick provides an overview of chaos and complexity theories that have greatly influenced our understanding of the dynamics of change (and transition). Biologist and holistic scientist Brian Goodwin talks about the principle of emergence and the relationship between ‘parts’ and ‘wholes’. Educator and environmentalist David Orr discusses education, eco literacy, systems thinking during a class at Schumacher College. This page contains additional resources for the Wicked Problems discussion session and provides important information for Assignment #1a and 1b. In particular we suggest watching the videos about Stakeholders at the bottom of this page. The video below shows how the Yellowstone Park ecosystem was transformed and restored as the result of the trophic cascade that followed the reintroduction of wolves in the 1990s. Similarly, Transition Design seeks to trigger large scale change through modest interventions in socio-technical systems. The video below demonstrates the danger of solutions that are conceived in isolation from surrounding social, technological and natural systems. The video below provides a brief explanation of a wicked problem. This video is an interview with a French journalist held captive by ISIS for 10 months. In it, he offers a systemic analysis of ISIS as a wicked problem that requires a counter-intuitive approach to resolution. Two examples of visualizing a wicked problem are shown below. The first was an assignment in an information design course taught in 2001 at CCA, diagram by Chanpory Rith. The challenge was to diagram the roots of terrorism described in a 2001 essay by Fritjof Capra inspired by the attacks on 9/11 called “Trying to Understand”. Note that values and feelings are represented as causal elements within the ‘ecology’ of the problem. 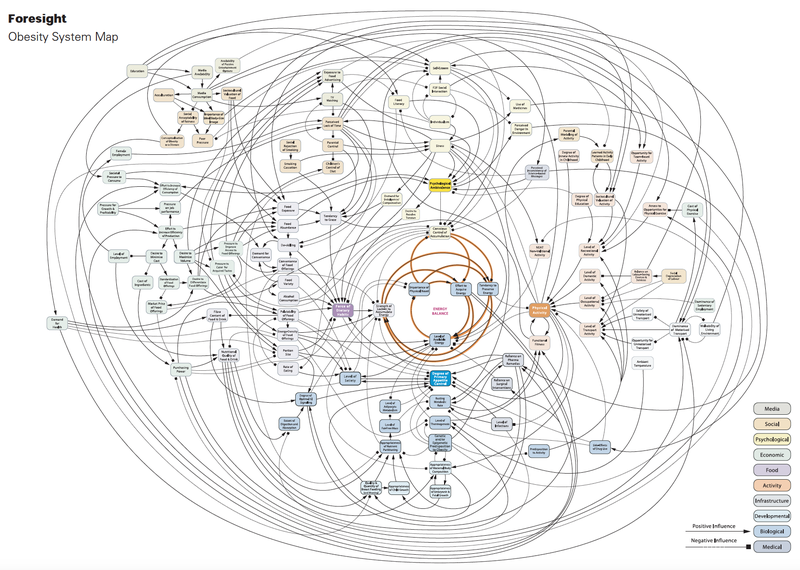 The second diagram maps the root problems and influencers of obesity. This map of the wicked problem of obesity was developed by the UK government https://www.gov.uk/government/publications/reducing-obesity-obesity-system-map. Note the various categories of influencers as well as the interconnections and interdependencies. The following videos illustrate different ways to think about the “stakeholder groups” that are affected by a wicked problem. There are several techniques shown below. Stakeholder mapping is well known within many disciplines such as business and design, however within the context of Transition Design the definition is expanded to include all groups affected by a wicked problem (including other species and affected parts of the natural world). The objective is to identify groups that might be overlooked in traditional approaches; usually groups with less power and influence. In addressing a wicked problem, the concerns and needs of ALL groups must be taken into consideration. Many of the examples below do not adopt this approach or concern, however they can be useful in thinking about identifying the myriad groups connected to your problem. Remember that with a problem like “lack of access to clean water”, the local and regional water supplies (watershed) would be seen as a stakeholder group, as would the various members of its ecosystem. Many of the videos show clearly defined processes for stakeholder mapping. You will not be asked to go into this type of in-depth mapping for Assignment #1b, however it is useful to see approaches that can be used in developing a deeper understanding of stakeholder concerns. See the Climate KIC website for additional information. Globalization I & II: In these two videos, John Green discusses globalization and follows the surprisingly complex path of t-shirt as it criss-crosses the world before coming to rest on your doorstep, and eventually in your dresser. He argues that Globalization is a bit of a mixed bag, and there have definitely been winners and losers along the way. In this episode John will talk about some of the benefits that have come along with it. 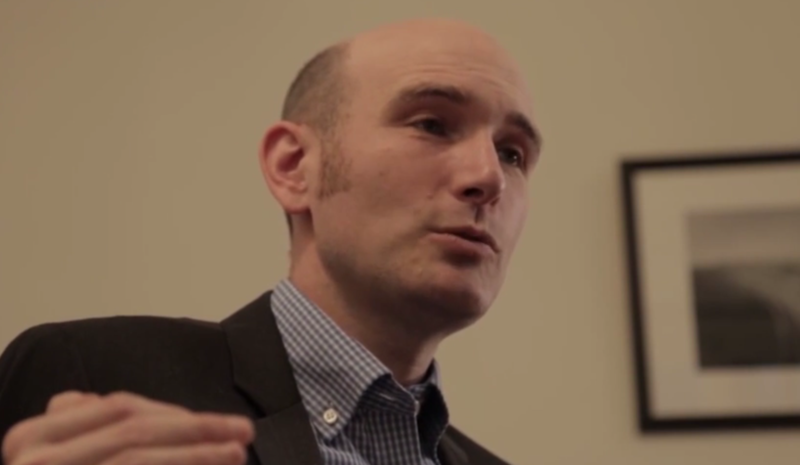 In the second video, he asks whether globalization is a net positive for humanity. While the new global economy has created a lot of wealth, and lifted a lot of people out of poverty, it also has some effects that aren’t so hot. Wealth disparity, rising divorce rates, environmental damage, and new paths for the spread of disease. So does all this outweigh the economic benefits, the innovation, and the relative peace that come with interconnected economies? Globalization: Not What We Expected. This video argues that Globalization is not what most people expected. The theory was that a rising tide would lift all boats, but has failed to do so. So has globalization failed? According to research, globalization can be redirected to improve the lives of people all over the world but the video argues it would require new ways of thinking/acting to achieve this. Vandana Shiva on Globalization: Environmentalist, lawyer and activist Vandana Shiva highlights the social costs of globalization, including extreme inequality and violence against women, and the need for environmental activism, seed freedom and sustainable agriculture in India and beyond. Interview at FES’s International Week of Justice, 2015. Brief video examines the individual impacts of Globalization. Globalization and Cross Cultural Communication: One of the assumptions underpinning Globalization is that people can easily and rapidly communicate effectively across cultures: The Global Village. International lawyer Peter Alfandary refutes this. French educated, Italian speaking, Alfandary describes himself as a mildly schizophrenic Brit. After 30 years practicing as an international lawyer, Peter decided to turn his lifelong fascination with different cultures into a full-time occupation – training and coaching professionals and senior executives on cross cultural management skills. He passionately believes that the need for cultural intelligence is increasingly critical as we move inexorably towards greater globalisation. This perspective on Globalization also touches on worldview and stakeholder in the Mindset & Posture sections.